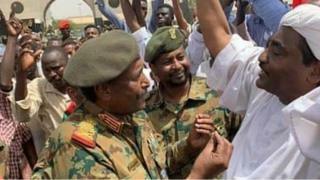 African Union Peace and Security Council don give Sudan military 15 days to transfer power give civilian-led political authority or face suspension from dem. For inside statement afta dem meet for dia headquarters for Ethiopia capital Addis Ababa, di council say "military- transition no be wetin di pipo of Sudan want". Dem don ask di military council "step aside and hand over power to transitional civilian-led political authority" within maximum period of 15 days, or else we go ban Sudan to take part for activities for AU activities until dem return back di constitutional rule na wetin di council add put. Last week Sudan military seize power, arrest President Omar al-Bashir afta nearly 30 years wey im dey power.